See what others have said about this course. 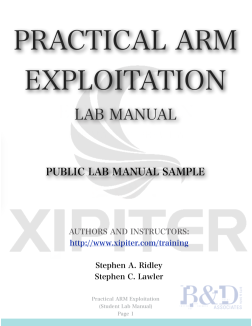 Practical ARM Exploitation is the first public course of its kind. Created by Stephen C. Lawler and Stephen A. Ridley, it sold out at its debut at CanSecWest 2012 and at all public offerings of the course since (including all 4 years at Black Hat Las Vegas). It has been taught internationally (both publicly and privately) in a handful of countries. It continues to be the go-to training for understanding software exploitation and reverse engineering on ARM platforms. The course even received recognition in the broader technology community at ARM TechCon 2012 (one of the largest semiconductor expos in the world) and on NPR in 2012. Subscribe for updates on this course. This course debuted to a Sold Out class at CanSecWest 2012 and Black Hat 2012 and has sold out at every public offering since (Black Hat 2013, Black Hat 2015, et al )! The purpose of this 4-Day course is to introduce students with prior basic exploitation experience (on other architectures) to “real world” exploitation scenarios on the ARM processor architecture. The reality is that exploitation these days is harder and a bit more nuanced than it was in the past with the advent of protection mechanisms like XN, ASLR, stack cookies, etc. As such, this course is called “practical” because it aims to teach exploitation on ARM under the real-world circumstances in which the exploit developer will encounter (and have to circumvent) these protection mechanisms. The course materials focus on advanced exploitation topics (circumventing protection mechanisms) using Linux as the platform as a basis to learn the ARM architecture but with the obvious applications being platforms running on mobile phones, tablets, embedded devices, etc. Sold out to 30+ students at Blackhat 2016 for the fourth year! Developers, IT Professionals, Mobile Developers, Hackers, Penetration Testers, Forensic Investigators, reverse engineers, software security auditors/analysts, software exploitation engineers, jail breakers, and anyone interested. Slide Deck: "Introduction to the ARM Architecture"
Use GDB to debug/modify a faulty ARM app, rudimentary code injection. Use IDA Pro to get familiar with ARM-isms: calling convention, IDA's ARM quirks. Lab: "Basics 2":"Spotting Vulns in Source"
Students audit some little code snippets. (Student skills baseline/assessment tool). Slide Deck: "Tools and the Lab Environment"
Lab: "Basics 3": "IDA and GDB tag-team"
Use IDA and GDB in tandem to comprehend application flow subvert the app. Trace through ARM app (dealing with ARM-isms: calling conventions, parameters) to reverse engineer and subvert a blackbox password app with embedded crypto. Students modify assembly code stub, assemble it, and extract the shellcode to be loaded into an "loader" app. Find and exploit a stack overflow bug in a vulnerable app. Students modify a "test harness" that both triggers the vulnerabilty and injects the payload. Modification of the harness with apppropriate addresses demonstrates comprehension. Review yesterday afternoon: Simple Stack Overflow walkthrough again. Slide Deck: "Stack Overflows and Ret2Libc"
Lab: "Simple Stack Overflow: XN Stack"
Slide Deck: "Advanced Stack Overflows"
Discuss reason for ROP (Code signing, ASLR, cookies). techniques/tools for manually finding gadgets manually on ARM. A walkthrough of useful gadgets found on our target. Structure of Gadgets"Chaining versus non-Chaining gadgets". 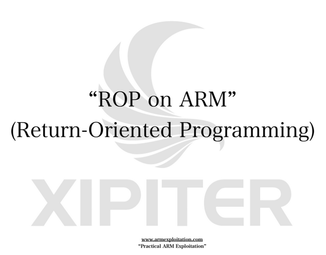 Some ROP tricks/nuances on ARM. Students find and exploit a vulnerable application by building a custom payload by stringing together a bunch of ROP gadgets (found for them by the instructors on the target). Lab: "Custom ROP with full root shell"
Students exploit a vulnerable application by handcrafting a ROP payload (with given gadgets) to obtain a full rootshell on the host. Intro to Heap Overflows on ARM: How stuff goes wrong, grooming/feng-shui-ing, etc. examining a toy heap implementation, TCMalloc's thread-cache freelist, and ways we can exploit all of these. Student will exploit a contrived network server, associating "protocol" events with heap events. Students will groom the target and exploit it with provided payload. More on heap exploitation. Singly Linked List (LIFO) exploitation. Review of Heap Overflow mitigations, taking a closer look at TCMalloc. Lab: "Simple Heap (WMW) Write Me Where"
Student will exploit a contrived network server (this time that uses TCMalloc), associating "protocol" events with heap events. Students will groom the target and exploit it with a payload they must modify. Slide Deck: "Application Level Heap Attacks"
Introduce application level exploitation: Techniques for investigating these kinds of vulnerabilities. Exploiting VTable overwrites, partial/full pointer overwrites. Student will locate and trigger a heap overflow in a custom heap implementation. Student will use heapspray and VTable overwrites to successfully exploit the application. Combining concepts introduced earlier (XN, ROP, and heap overflows) students will be introduced and shown how to evade XN by "flipping" the call stack into forged stack frames on the heap. Students will also be introduced to techniques and "gotchas" around finding "pivots" and nuances about ARM that make this more interesting. Students will use a heapspray or similar technique to overwrite a C++ object to create a fake vtable entry that redirects the stack pointer into the heap...executing their ROP payload to get a shell. Students will be introduced to ASLR and how it is implemented as well as many of the nuances of how to defeat ASLR (infoleaks, developer debug code, RPC/RMI leaks, predictable ASLR PRNG, uninitialized mem, JIT, etc). Students will find and exploit an information disclosure vulnerability to remotely determine the location of libc and successfully craft (modify a given) payload to successfully evade XN, ASLR, and obtain a connectback shell into the owned application.